Serbia has chosen on Sunday old content in a new pack. The former Serbian radicals are already redressed democrats and European integrationists with an absolute majority in Parliament and practically with no opposition. The conservative Serbian Progressive Party (SNS), led by Alexander Vucic, has won the snap elections, called with the only aim to affirm his role as the most powerful man in Serbia and to serve him the premiership. According to preliminary data, the party has received 48.2% of the votes which secures the possibility for a government of their own. The second largest party is of the late dictator of former Yugoslavia Slobodan Milosevic - the Socialist Party of Serbia (SPS) - led by incumbent PM Ivica Dacic. In spite of their two-year long governance, the party has won almost the same share of votes as in 2012 - 13.6%. The biggest change, however, is among the opposition parties which went through precisely the same process as the first right-wing opposition in Bulgaria - fragmentation and slow but, for now, solid, melting. A little before the elections, former Serbian President Boris Tadic made a surprising move by splitting from the Democratic Party (DS) and creating New Democratic Party (NDS). For the two months old campaign he has managed to achieve, practically, the same result as his former party. Under the leadership of Belgrade's former mayor, Dragan Djilas, DS received 6.3% of the votes, while Tadic's new party got 5.7%. With such a score and obvious inability to work together it seems that the two parties will not be able to join forces in a joint opposition to Vucic. For now, under the threshold (5%) remain political dinosaurs like Vojislav Kostunica, a nationalist and eurosceptic, and the left leaning economist Mladjan Dinkic. 6 765 988 registered voters had the possibility to choose from 19 lists for Serbia's Skupstina (parliament) in the same day with elections for Belgrade. Analysts in the country were unanimous that this time the campaign was not dirty, it was calm and with a positive spirit. The issues of Kosovo and the EU were not major ones. The most important issue was Serbia's economic situation and also the fight against corruption. There were only minor irregularities, observers of the elections said, among whom from the Organisation for Security and Cooperation in Europe (OSCE). This is the best result from the introduction of the multi-party system in Serbia, said in his victory speech Alexander Vucic who compared his achievement with Slobodan Milosevic's in the beginning of the 1990s. He made it perfectly clear that he is ready to talk not with everyone but with many "without underestimating their election results". In the same time, he said that the Serbian Progressive Party has an absolute majority and does not rely on "any mathematics". The main battle of the new government will be against corruption and high unemployment which in 2013 reached record heights of even 28%. 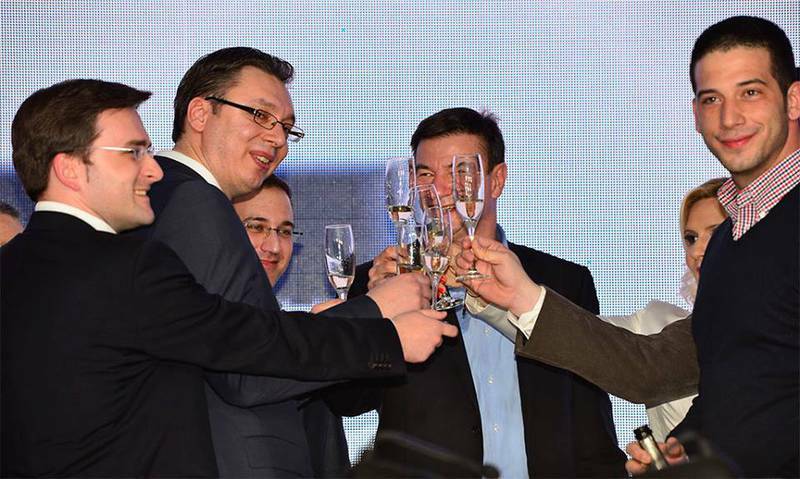 Vucic promised that as early as mid-term there will be tangible changes in Serbia. The incoming Serbian premier had an interesting choice of wording in terms of the country's geopolitical orientation. "I'm sure that Serbia will continue its European path. I'm confident that we will cooperate with all our friends around the world - the Russians, the Americans, the Chinese and all the others". He specifically thanked President Putin's envoys and all the other high placed representatives of European people's parties who were in Belgrade for the elections. Quite interesting are the results of Ivica Dacic's Socialist Party which in 2012 achieved almost the same election outcome. But then the SNS did not have sufficient votes to form own government which is why there was a coalition agreement putting Mr Dacic in the prime minister's chair and Vucic played the role of a first deputy. Ivica Dacic participated in the previous government led by Mirko Cvetkovic, where he was a deputy prime minister and minister of home affairs. The party stood in the elections in a coalition with two smaller parties. 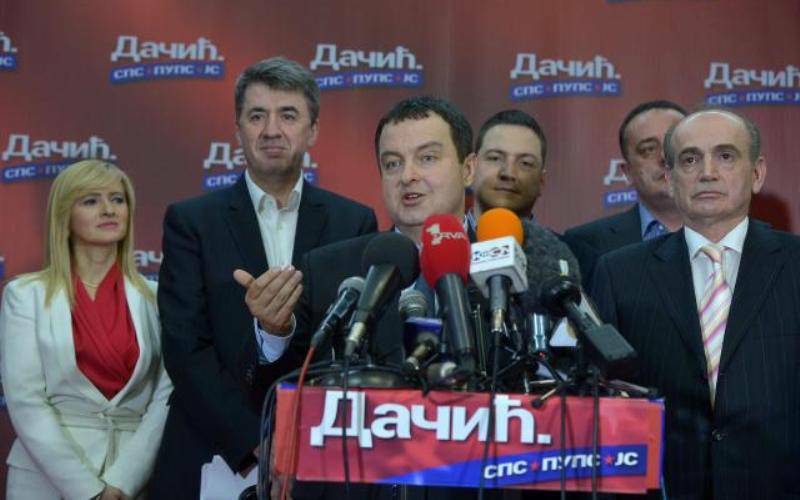 After the announcement of the first preliminary results on Sunday evening, Mr Dacic said that this was a significant and even historical result, "which cements our political position on Serbia's political stage". This, according to him, was due to the clear policy and positions and to the good campaigning. Otherwise, we would have ended up like the other parties, he said adding that the opposition parties suffered a real debacle in these elections. Ivica Dacic was confident that the new government will continue Serbia's European path and the dialogue with Pristina which, in fact, made the European path possible. But will the Socialists be part of the government is a question that will get its answer in the coming days and weeks. 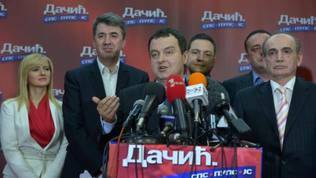 Dacic expressed readiness for talks about common actions if SNS took the initiative. Under such circumstances it will be highly unlikely the SPS to play opposition or at least strong opposition that puts the government's actions into question. 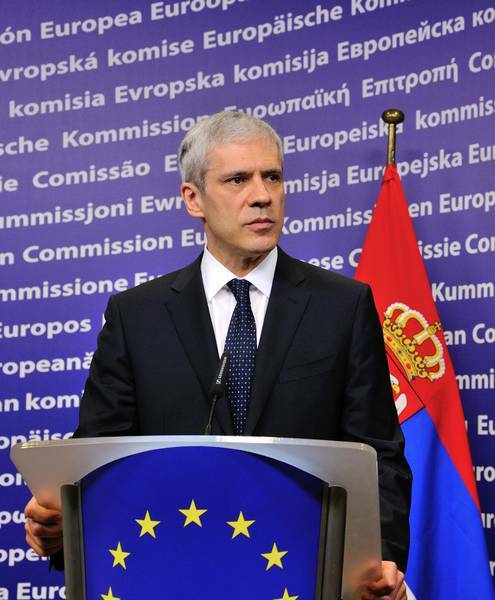 The big surprise in these elections was the behaviour of Serbia's ex-president Boris Tadic who was not ready to accept the issue of Kosovo in one sentence with the issue of EU integration. This is the reason why Mr Tadic refused to take part in government after the 2012 elections and later announced he was leaving the political stage. 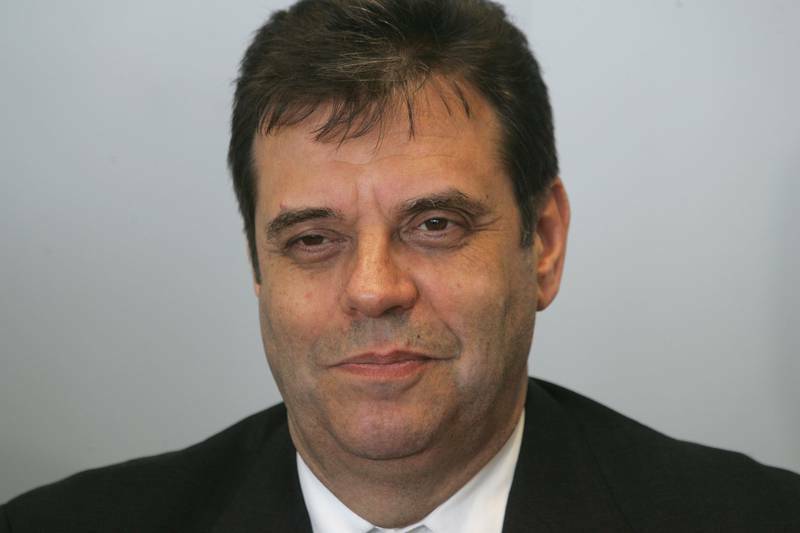 His leadership seat in the Democratic Party was taken by Dragan Djilas. 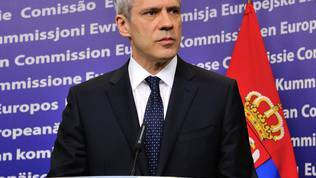 The new political and party status quo, however, did not remain for long acceptable to Boris Tadic and he tried to challenge Mr Djilas's leadership. The situation ended up with Tadic leaving the DS two months ago and founding a new political force - New Democratic Party (NDS). A purely one-man party given that the time was not enough for building party infrastructure and forming an ideology of its own. Something Tadic himself admitted on election night. Therefore, voters voted for him alone. He accepted his electoral outcome rather as a victory because with 5.7% he jumped over the five-percent threshold and will have deputies in the Skupstina. "Under circumstances where some political parties that have existed for a quarter of a century have not made it in parliament, it is in some way a big and pleasant surprise", said the former head of state, pointing out, though, that he will take responsibility for what has not been achieved. It was not clear what exactly taking a responsibility means. Tadic explained his decision to split from the DS saying he wanted to provide voters with options against the backdrop of the "big disappointments" from the opposition in the past two years that "have led to asymmetry in our society which has put at risk the very foundation of our political society". According to Tadic, SNS is a huge force which, however, does not have an equivalent among the opposition. He was again unclear on whether he will be opposition or will participate in government if invited. Tadic's recent partner in DS Dragan Djilas was until recently mayor of Belgrade, but was forced to resign in a way that very much resembled the political intrigues in the US hit series House of Cards. He regretted the election outcome pointing out that one of the reasons was the division of the opposition. Besides, in his words, the government that is about to be formed will not even in the least get closer to what was promised. "Today we fought for democracy and seats in parliament, but as of tomorrow we will fight for the democracy in Serbia", Mr Djilas said vaguely, stating his intention his party to be the strongest opposition in parliament. DS did not perform well at the local elections in Belgrade, too. "I'm disappointed with our results in Belgrade", he said, emphasising this after his five-year stay in the mayor's chair. "Today we have a new political reality", Djilas concluded reconciled. He recalled that the thought of not getting in parliament never crossed some parties' mind but that happened. Such is the Democratic Party of Serbia (DSS) of ex-Yugoslav president Vojislav Kostunica, which gathered 4.2% of the votes and thus remained out of the Skupstina. As a passionate opponent of the European integration and Kosovo's independence, Kostunica blamed the West for the current political situation and said that the pressure and interference of the western forces in Serbia in the past years was strong and open. Kostunica also blamed the "highly aggressive and expensive campaign and propaganda" and called for complete transparency that is supposed to unveil how the endless TV spots and billboards were financed. "This would be a sign of real intentions to fight corruption", Mr Kostunica added. The support for Vojislav Kostunica and his nationalistic rhetorics has been on a steady decline which is a sign for the U-turn of the attitudes of the Serbian voters. Unlike the other big loser in these elections - the United Party of Regions of Mladjan Dinkic - Kostunica did not state any intentions to leave the political stage and said he will continue his fight against a potential majority dictatorship. Mladjan Dinkic and his party received only 3% of the votes. Mr Dinkic is one of the leading economic minds in Serbia. 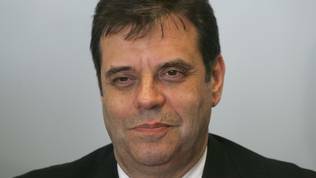 He was a governor of Serbia's central bank, a minister of finance in several governments, including in Vojislav Kostunica's cabinet in the beginning of the 2000s. Because of the suspension of negotiations on EU association agreement, however, he resigned back then. He was elected a person of the year in 2002 by the influential political weekly Vreme. Dinkic doubted that good days were to come in Serbia but hoped that some of his party's ideas would be adopted. He is an opponent of the belt-tightening policies. 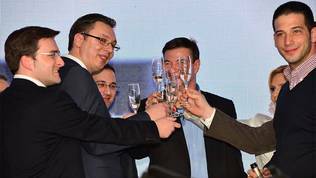 Under the threshold remained also Cedomir Jovanovic's Liberals and Sasa Radulovic's new party. Radulovic was until very recently a minister of the economy in Dacic's government but resigned, again, under pressure by Alexander Vucic. His movement "That's enough!" managed to receive only 2.1% of the votes, according to preliminary results. The political stage in Serbia resembles strongly the situation in Bulgaria. Alexander Vucic is very much like Bulgaria's former premier Boyko Borissov in terms of charisma and as a leader of a populist party. Just like Mr Borissov, Alexander Vucic has demonstrated skills of a "soft" dictator with huge influence over media. Some less dependent media wrote in the past months about a steadily deteriorating media freedom which was mentioned also by some of those who lost the elections on Sunday. It is a good news that this issue will be one of the main ones during the Serbia's accession talks with EU as well as the country's economic situation. Because of the many parallels with the failure of transition toward stable pluralistic democracy in Bulgaria, Serbia will be a huge challenge for the EU's enlargement policy. On the one hand, fight against organised crime and corruption will be difficult because of their scale and because quite often oligarchy is masked as honest business under the wing of charismatic political leaders. The most important criterion, though, will be media freedom. On the other hand, especially in the context of the Second Cold War, a challenge for the European-Serb relations will be the new government's desire to love with one heart both Russia and the EU. A dilemma which holds Bulgaria's economy a hostage for decades and the society irreconcilably divided along the axis pro-Russians/pro-Europeans. The difficulty stems from the fact that EU and Russia do not share a common system of values which makes Belgrade's desire for friendship with both communities quite controversial. That is why the EU should be very persistent in its efforts to see that Serbia, indeed, is oriented toward European values. For more efficient monitoring and preciser assessment of the real situation on the ground, the European Commission will not err if it started to make interim reports on Serbia's progress and if it entirely detached its progress from the rest of the enlargement countries. It is also worth paying attention not only on Bulgaria's failures, but on Croatia's successes too. As recently an analyst commented, Serbia needs the Sanader catharsis to be able to turn the page. Is this what the Serbian voters voted for or to reaffirm the status quo is a question that is yet to be analysed. What is clear, however, is that the only unequivocal winner in these elections is Alexander Vucic. We are yet to witness if among the winners we will be able to find rule of law and democracy.